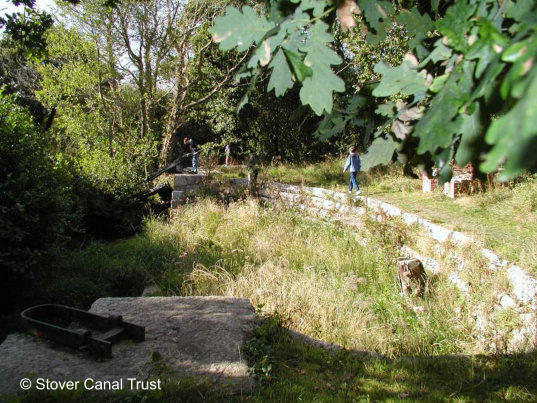 The lock had become overgrown and choked with vegetation, as seen in this photo from 2002. 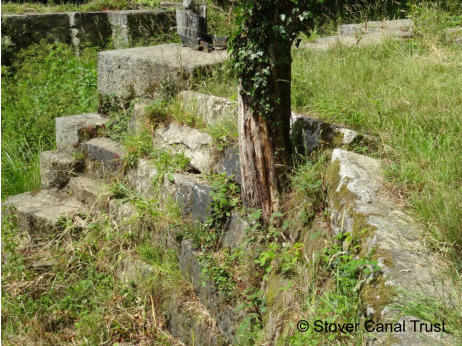 Trees had grown through the granite walls. 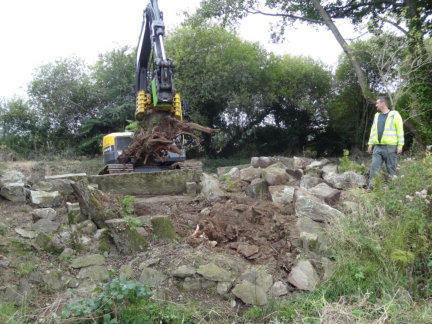 Clearance was always going to be a major job requiring money for equipment and materials, and manpower. 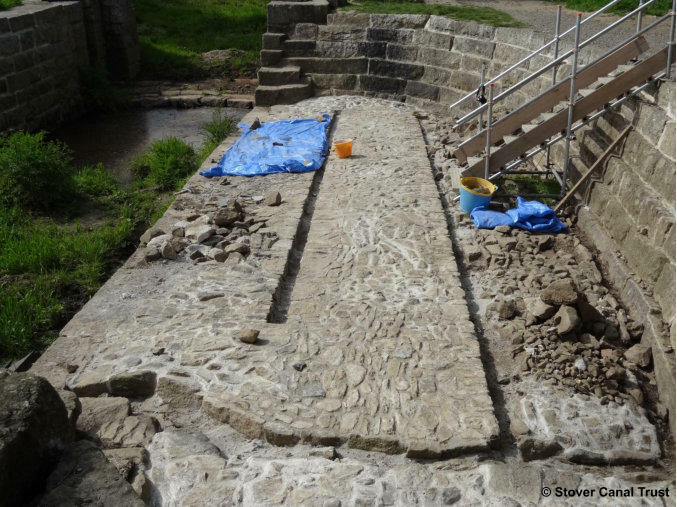 The experienced WRG volunteers made rapid progress. The difference could clearly be seen after just one week. They also were seen on local TV! 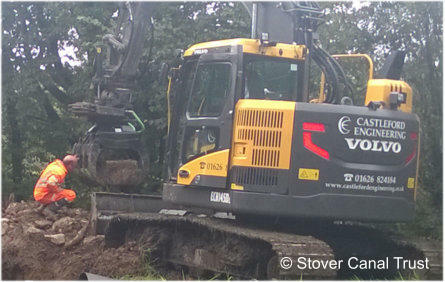 Here you can see where a tree has been removed by hand. 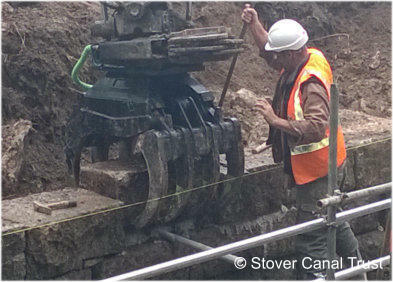 Those on the opposite wall needed the use of heavy machinery. 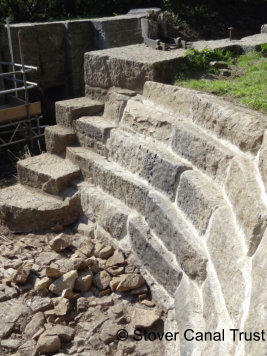 This work was carried out in early October by local contractors. All credit is given to Castleford Engineering and particularly Andy on the machine in the early works with mason Davin, seen here placing one of the granite blocks. The skill shown by both in moving such huge pieces with such a delicate touch was a joy to watch! 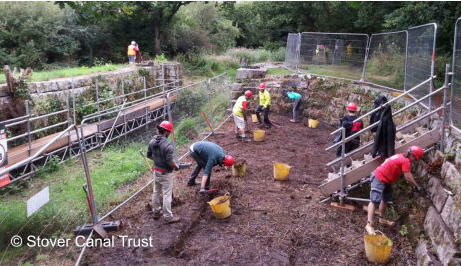 Our thanks go to all the people and organisations that have made the restoration possible. 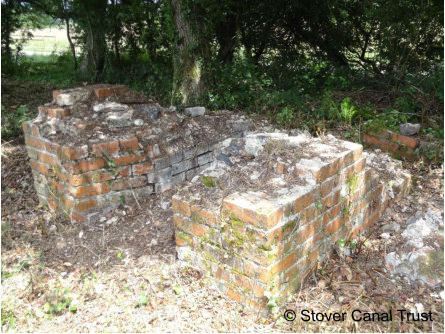 Also on site were the remains of the structure where water was boiled to steam the wooden planks into shape. 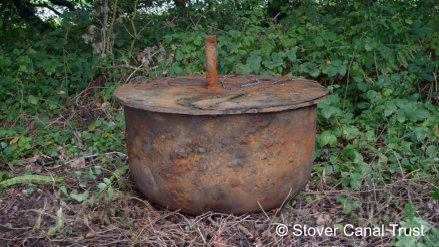 The base was reinstated and the cauldron was retrieved from the bed of the lock. 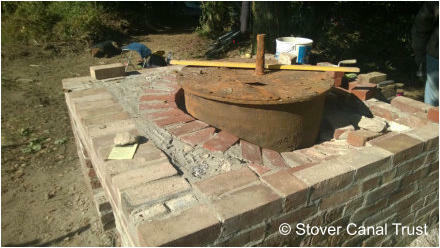 The brickwork was built up to form the flue which directed smoke and hot air around the cauldron for maximum efficiency. 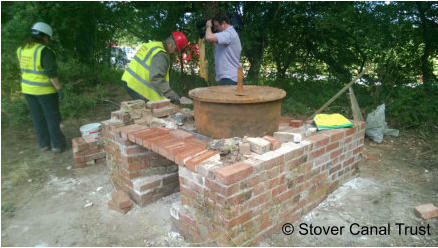 Here is the boiler in October 2016. 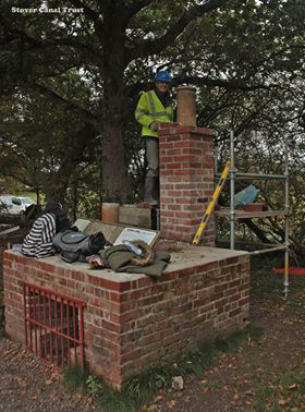 Craftsman Rob Brotherston has used Lime mortar in the authentic reconstruction. The scaffolding was finally removed at the end of October to reveal a sight not seen for a generation. 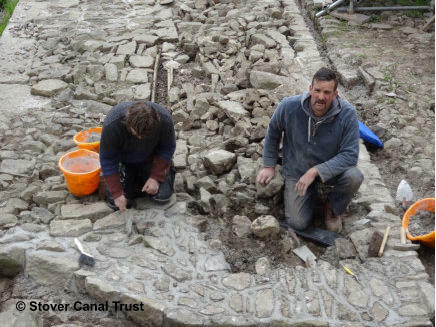 Work continued in the Spring of 2016. 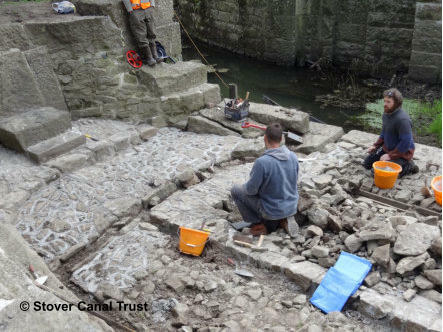 Our wonderful mason, Davin, and his assistant have repointed the cobbles along the base of the dry dock using as many of the original stones as could be found on-site. 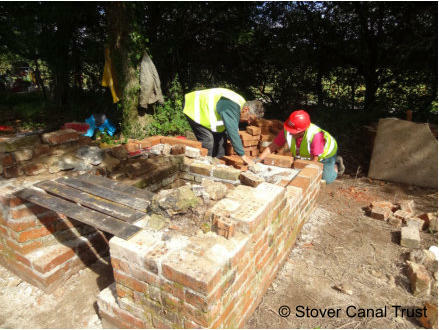 Also, we aim to complete the rebuild of the boiler structure - see below. This is a continuation of the restoration work started in 2015. 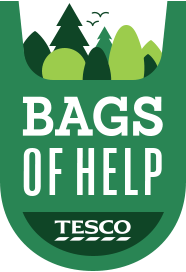 The majority of this years work is funded by Tesco who teamed up with Groundwork earlier this year to launch its Bags of Help initiative in hundreds of regions across England and Wales. 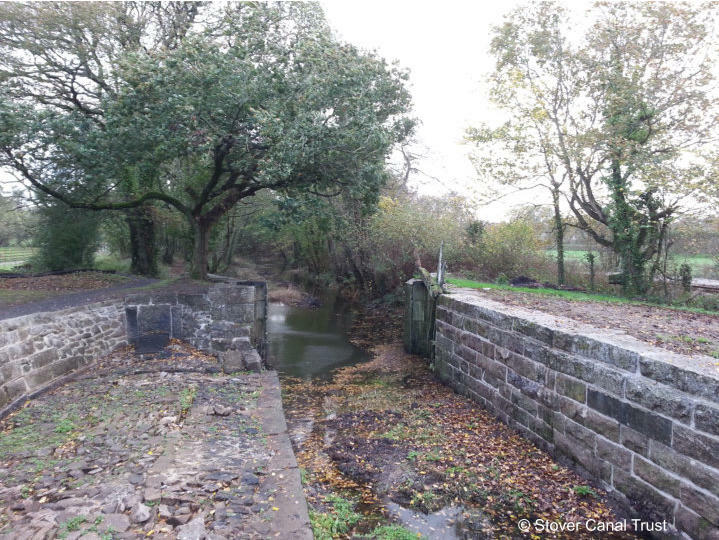 The scheme sees three community groups and projects in each of these regions awarded grants of £12,000, £10,000 and £8,000 – all raised from the 5p bag charge. Shoppers voted us into second place in the Teignbridge event in March. More details can be found on the Tesco website here . 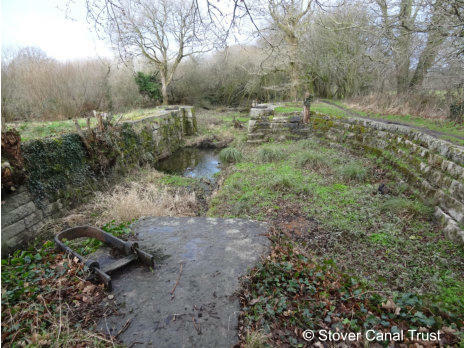 We are very grateful to Tesco for including the work of the Stover Canal Trust in their scheme - work which is done for the benefit of the community at large, whose support we also appreciate. 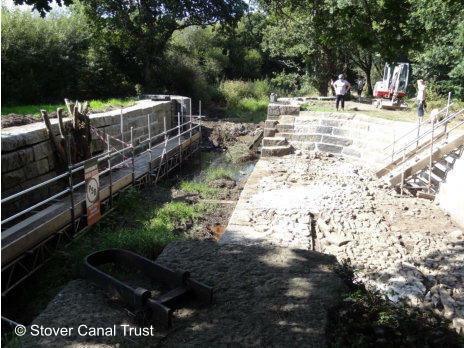 During October 2016 we contracted a large machine to dredge the silt from the bottom of Graving Dock Lock and to remove some large tree roots from the area of the overflow weir. 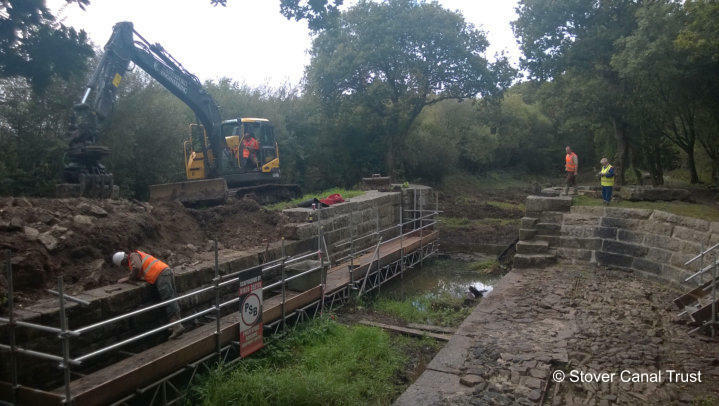 Castleford Engineering is a local firm from Liverton who specialise in water based civils work and helped us last year with the reconstruction of the lock walls. 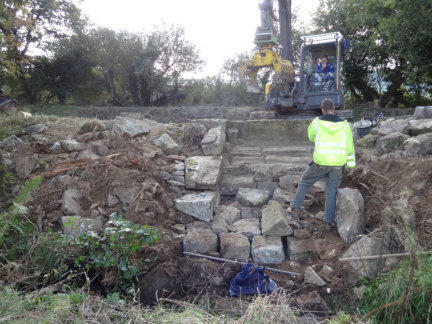 Local mason Davin Foster from Bishopsteignton trades as the Rural Craftsman and was also on hand to lend his experience in rebuilding the weir. 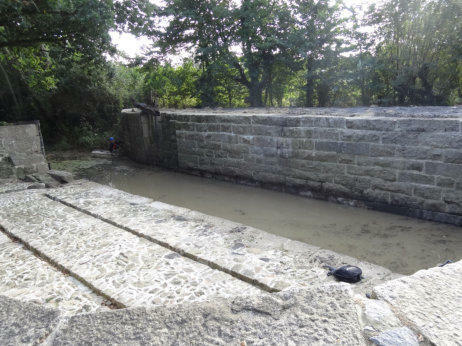 Davin reinstated the lock walls last year and regrouted the bed of the graving dock earlier this year. 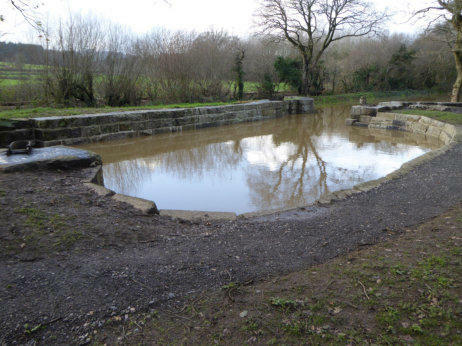 The works used the last of the funds we won in a public vote from the Tesco 'Bags of Help' scheme. 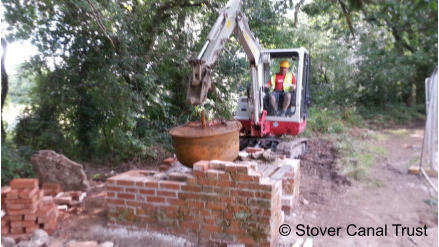 Tree root removal takes no time with the right equipment! 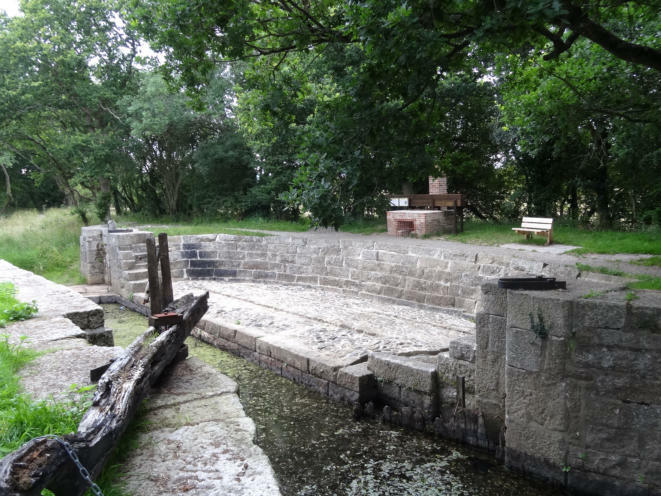 The lock pictured during the December 2015 flooding. 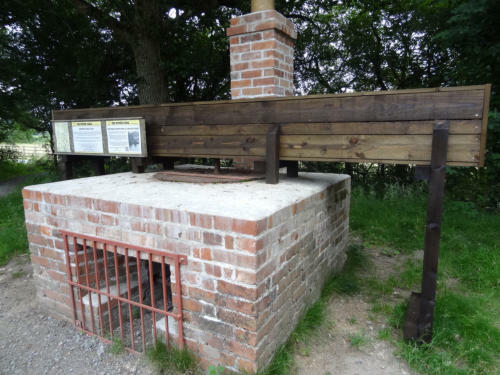 And here in June 2017 with the steambox in place.